I feel like I talk about the weather too much and yet the weather is often the deciding factor in making weekend plans. 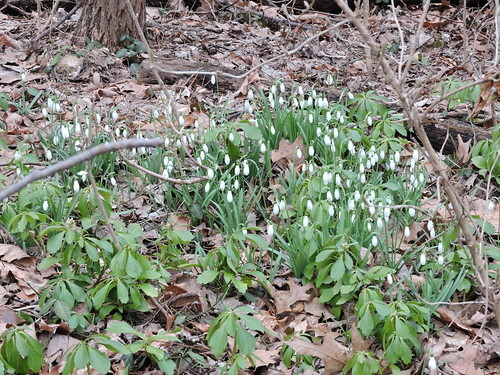 This Sunday, for instance, we had snow forecast to start at noon, so we went out before noon to the park to walk and look at the flowers we figured might be gone on Monday, though the crocuses that were open this week were tightly closed as if they knew a storm was coming. There was a black egg over the gym on the hill, so I summoned people for a Dialga raid (and caught a Cranidos) before the precipitation drove us to the car, to the food store, and home. We had a spectacularly unexciting afternoon involving doing some cleanup in the basement and watching Maryland's men's basketball team lose to Michigan. Then we had piccadillo for dinner and were actually home for a change for all the Sunday shows we watch: Supergirl, which is getting draggy and needs either to have fun with Alex not remembering about Kara or wrap it up, then Victoria, ending a season I will not miss, then Madam Secretary, which as always was a bit didactic but pretty great, then Last Week Tonight, not as funny as the psychics but still enjoyable!